Q: Mexico has been a big influence on your work. What first drew you to Mexican folk art – masks, carved wooden animals, papier mâché figures, and toys? A: In 1991 my future sister-in-law sent, as a Christmas present, two brightly painted wooden figures from Oaxaca. One was a large, blue and white polka dot flying horse, the other a bear, painted with red, white, and black dots and lines. At the time I was living in Alexandria, Virginia, studying at the Art league School there, and working as a full-time artist. I had resigned from the Navy after seven years on active duty, although I still worked one weekend a month at the Pentagon as a reservist. I was looking for something new to paint with soft pastel, having found portraits deeply unsatisfying. I had never seen anything like these Oaxacan figures and was intrigued. I started asking friends about Oaxaca and soon learned that the city has a unique style of painting, the self-titled Oaxacan school, and that the painter, Rufino Tamayo, and husband and wife photographers, Manuel and Lola Alvarez Bravo, were from Oaxaca. (Manuel Alvarez Bravo founded an important photography museum there). I had been a fan of Frida Kahlo, Diego Rivera, Leonora Carrington, Remedios Varo and other artists associated with Mexico, and had a long-standing interest in pre-Columbian civilizations. I knew some Spanish, having studied it in high school. I began reading everything I could find about Oaxaca and Mexico and soon became fascinated with the Day of the Dead. In 1992 my future husband, Bryan, and I made our first trip to Mexico, spending a week in Oaxaca to see Day of the Dead observances and to study the Mixtec and Zapotec ruins (Monte Alban, Yagul, Mitla, etc. ), and another week in Mexico City to visit Diego Rivera’s murals at the Ministry of Education, Frida Kahlo’s Casa Azul, and nearby ancient archeological sites (the Templo Mayor, Teotihuacan, etc.). 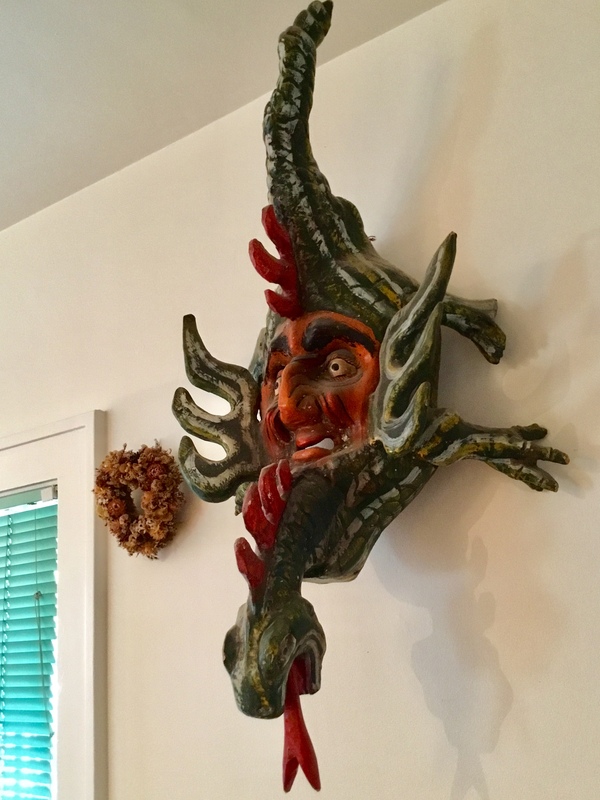 I began collecting Mexican folk art on that first trip. I still have fond memories of buying my first mask, a big wooden dragon with a Conquistador’s face on its back. Bryan and I found it high on a wall in a dusty Oaxacan shop. The dragon was three and a half feet long and three feet wide. Because it was fragile, we hand-carried it onto the plane and were able to store it in the first class cabin (this was pre-9/11). I chuckle to remember that we covered its finely carved toes with rolled up socks to prevent them from breaking! I have been back to Mexico many times, mainly visiting the central and southern states. I travel there to study pre-Columbian history, archaeology, mythology, culture, and the arts. It is an endlessly fascinating country that has long been an inspiration for artists. Comments Off on Q: Mexico has been a big influence on your work. 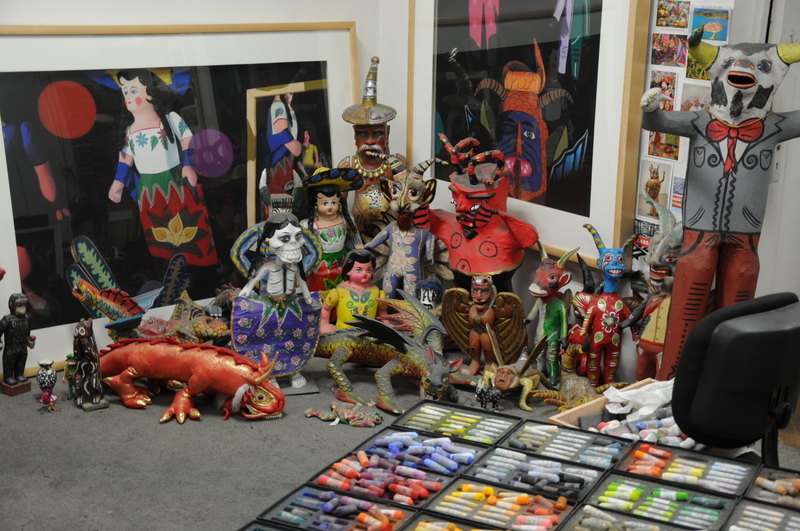 What first drew you to Mexican folk art – masks, carved wooden animals, papier mâché figures, and toys?